make / 10 minute beauty! 1. Cut white cardstock 4.0 x 5.50 inches. 2. 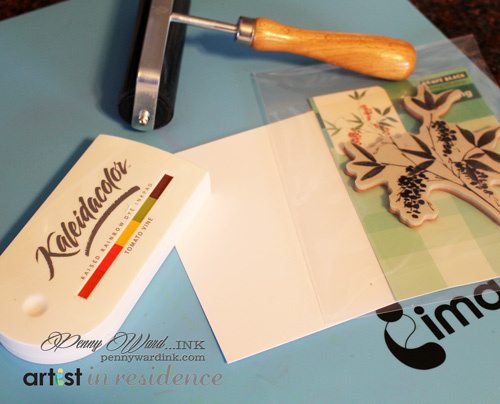 Using Kaleidacolor Tomato Vine and a brayer, ink stamp and apply to White cardstock along the left edge and top. 3. 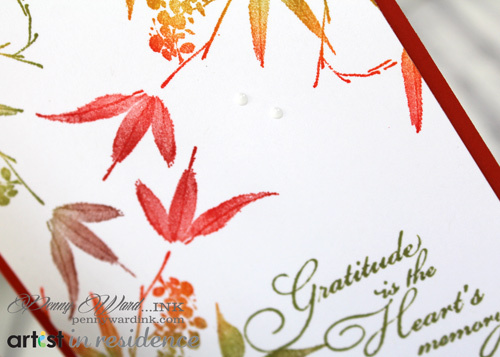 Stamp sentiment with VersaFine Spanish Moss. Mount card front to Burnt Orange cardstock cut to 4.25 x 5.50 inches. Mount this panel to a White card base trimmed 4.25 x 11 inches and folded in half. Add Pico Wedding Dress dots around the card. 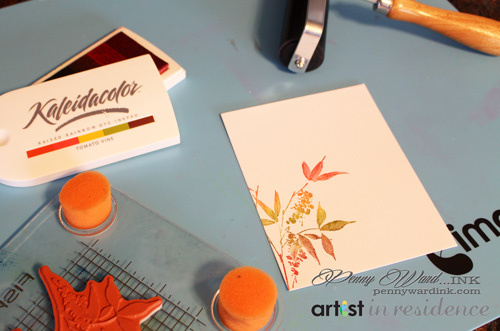 Miscellaneous: White & Burnt Orange cardstocks, Brayer, Favorite adhesive.